Many internet business owners believe they don’t need to write a business plan for their business. Nothing could be further from the truth. You need to at least put together a simple business plan. I’m not talking about anything fancy where you put together dozens of pages to find investors or get a loan. You just need a simple easy to write plan that keeps you on track and keeps you accountable to your goals. They work. Here’s a quick step-by-step system to put together a simple plan for your online business. Step 1: Write Your Business Plan On One Page Only. If you can’t define your business, your target customers, and your primary goals in one page; you’re simply not focused enough. I’ve used “The One Page Business Plan” book by Jim Horan multiple times with my coaching clients to help them put together their plan and schedule (which I then keep them accountable to). I don’t know if you can really call this a book though as it is more of a series of worksheets to help you put together your plan. Step 2: Create Your Vision Statement. Your vision statement should be very specific about what kind of business you’re building. Remember this is your vision of your company. It needs to be created so you can share it with your team members…and communicate it to any partners you work with. Who is my perfect client (you’re not trying to sell to everybody, are you)? Where are my customers already buying from? What is my target income in the next 1 year and next 90 days? Step 3: Define Your Mission. Describe why you’re building your business. A short description of one sentence works best. Also go a step further and ask yourself why your customers will buy your products and services? What problems do your products solve? What makes your company unique in the market? Step 4: Write Down Your Goals And Objectives. – Sell 20 each of my products a month starting in April. Step 5: Write Down The Strategy For Your Business. What strategic steps are you going to take to reach your goals? Are you going to focus on PPC? Are you going to go after affiliates and joint venture partners? Maybe free content such as blogs and articles will be your primary marketing technique? What about new products? How often and how will they each be produced in your business? There are many strategies for growing your business, but you simply don’t have time to focus on them all. And it’s possible some of the strategies that work for one company aren’t write for what you’re offering. As mentioned recently in the 7 Make Money Online Myths, there are many ways to build an internet business. You CAN’T focus on all of them at once. That’s a recipe for indecision and inaction. Create your strategies and follow them. Step 6: Create An Action Plan. Write down the specific actions you need to take daily, weekly and monthly to achieve your strategies and goals listed above. Each action plan will relate to a goal or strategy you’ve already written down. We’re keeping this to one page so you can’t create a mile long to-do list. You will only have room to write the most important actions you have to take to get yourself to success. Focus on the priorities! These six simple steps should help you to create a simple, but effective plan to steer your business to more success this year. 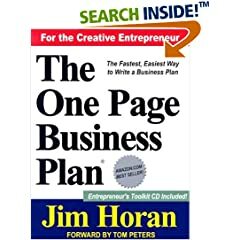 As already mentioned I’d recommend you pick up “The One Page Business Plan” by Jim Horan to put together your simple plan (it even comes with a CD of the worksheets and scorecards to keep you on track). That is simply a link to Amazon’s page for the book, not an affiliate link.